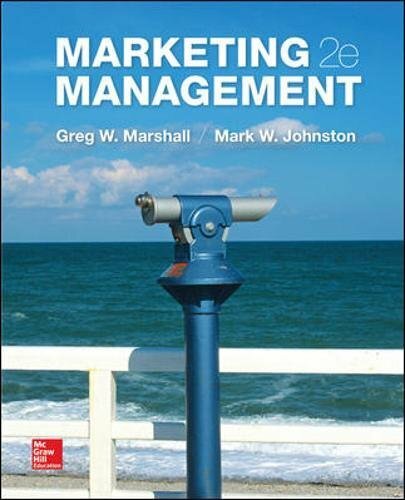 78028868 – Marketing Management by Greg W. Marshall Associate Professor of Marketing Dr.
78028868 -Marshall/Johnston’s Marketing Management, 2e has taken great effort to represent marketing management the way it is actually practiced in successful organisations today. Given the dramatic changes in the field of marketing, it is a sure bet that the job of leading marketing manager&#39s contributions to the organisation and its customers, clients, and partners has changed at the same level. Yet, no marketing management book on the market today fully and effectively captures and communicates to students how marketing management is really practiced in the 21st century business world. Clearly, it is time for an updated approach to teaching and learning within the field. Marketing Management 2e is designed to fulfill this need. Author: Greg W. Marshall Associate Professor of Marketing Dr.